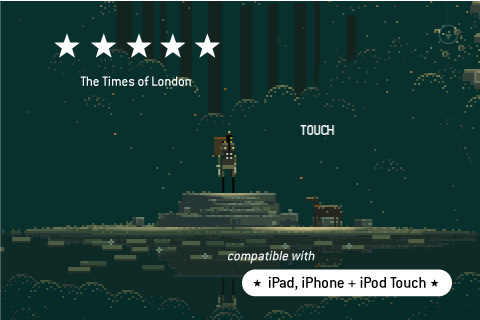 There’s almost nothing in the app store that feels quite like epic adventure game Superbrothers: Sword & Sworcery EP. It’s one part immersive audiovisual experience, one part grant based art project, and one part exploration (non RPG) game that feels like it’s been founded in the arms of Zelda. The Superbrothers creation feels like all of these, yet somehow all these labels and signifiers don’t quite pin the experience down. 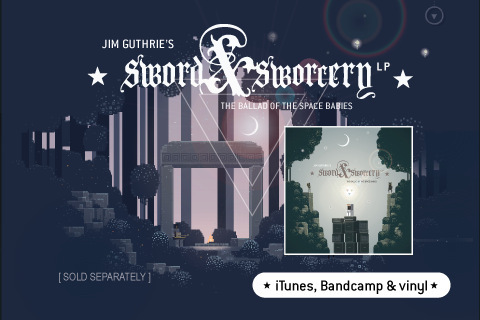 Like any cult classic in the making, there’s nothing that describes the experience like living it, which is what Sword & Sworcery is all about. 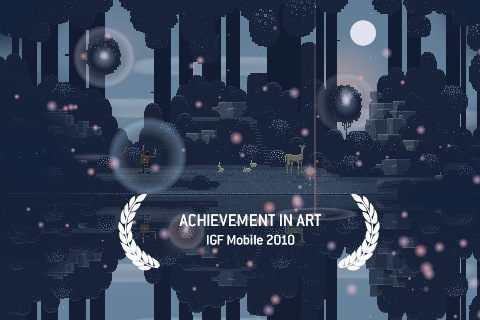 The game’s brick pixels and simplistic game elements (which includes some puzzles and rudimentary fighting) harkens back to the days of early era adventure games but what really separates Sword & Sworcery from the rest is the almost humorously highbrow element of artistic quality that’s been applied to the game. In this way the game isn’t for everyone, but those who love it have volunteered to let the experience flood through their Twitter streams in utter appreciation. Sword and Sworcery starts with a 15 minute exploratory audiovisual experience where a stilt looking Scythian wanders around a brooding forest apparently in search of something that hasn’t been described yet. All the while music created by Jim Guthrie rises and falls like a carefully crafted electronic ballad, inching the plot forward on a two sided vinyl record. Other narration (and a slow reveal of what Sword & Sworcery is really about) comes by way of glowing white text boxes that usually enter the scene when the protagonist Scythian meets a surprising element or new character in his wandering adventures. 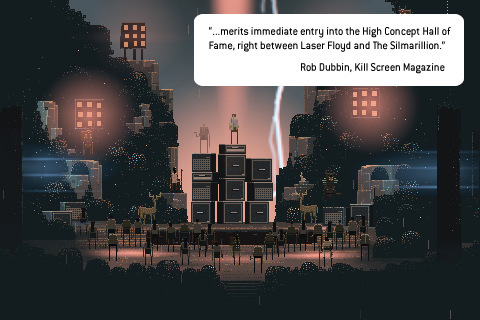 Sword & Sworcery’s plot moves forward in a slow drip meant to emphasize the artsy audiovisual experience, but what separates the experience from other experiments in art is the gameplay elements grounded in puzzles. Moving forward through the moody woods and expansive fortresses often requires some discovery and puzzle solving process that’s sometimes simple enough but on occasion quite obscure. I sometimes found myself dragging my character around the landscape until I stumbled upon solutions, which is probably part of the reason why a collection of guides have been released to lead players through the game. While most of the game is spent wandering through this intense audiovisual fantasy land, occasionally you must rotate your iPhone to drop into fighting mode. Specific checkpoints let you tweet out your Scythian’s most recent status in the game’s typically satirical voice, but that pretty much covers the game experience without giving it all away. The game’s crafty commentary and overall story arch play like the stuff of academics while the slow paced quest elements appeal to fantasy adventurers. This is the kind of obsessive, immersive experience that lives outside of time, and in some ways that seems to be the point entirely.